The term "bullfighter" brings to mind macho men in elegant costumes who perform in big arenas in Spain. In American rodeo, bullfighter means something entirely different. The rodeo bullfighter is charged with keeping the contestants in a bull riding competition safe after they fall off the bull. 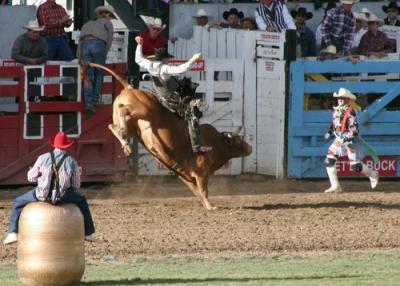 This bullfighter's job is to distract the bull and move it away from the cowboy that just tumbled off its back. Wait, isn't that what the rodeo clown does? Rodeo bullfighters are usually dressed like clowns, but the duties of entertaining the crowd with comic antics have been removed from the job duties of protecting the cowboys in many larger rodeos. In smaller rodeos though, the clown still amuses the crowd while providing safety for participants and spectators alike. No matter the bullfighting instance above you may one day find yourself watching, both clearly have their nuances. There is a lot of nuance in banking these days as well. Consider that the FDIC has just proposed a ruling aimed at making the lives of community banks a little easier (perhaps), by revising the rules for calculating insurance for banks under $10B (that have been insured for at least 5Ys). The calculation for FDIC assessments has always been a bit of a blunt tool, so refinements are of interest to all bankers and in this case, particularly to community bankers. The refinement takes into account a bank's CAMELS ratings, leverage ratio, net income, non-performing loan ratios, OREO, core deposit ratios, 1Y asset growth and loan mix. The FDIC indicates these measures reasonably predict a bank's future risk of failure and therefore better reflect the actual risk they pose to the fund. Like all calculations based on a model, however, the outcome will only be as good as the information being plugged in and the assumptions that are being used. One new ratio, the loan mix index, has some similarities in approach to Basel III in that it penalizes some categories of loans and rewards others. A bank calculates each of its loan categories as a percentage of assets and then multiplies it by a historical charge-off rate provided by the FDIC. The rate provided is based on 15Ys of historical data to include an entire economic cycle, but will be an industry-wide number in an attempt to standardize the calculation and the result. There is no extra credit for banks that carefully and successfully manage higher risk portfolios. Similarly to Basel III, the most penalized sector will be construction lending, in that it had the highest level of charge-offs in the last credit crisis. Another new ratio, the core deposits/total assets ratio reflects regulatory concerns about deposit and funding quality. These were key areas of problems during the credit crisis, so scrutiny has increased here. In the crisis, banks with problem assets had difficulties, but those with weak deposit portfolios were even more at risk. Previously the deposit calculation only looked at brokered deposits, but it will now pull in a broader measure of deposit quality. For its part, the FDIC anticipates these changes will be revenue neutral, meaning some banks will pay less but others a bit more. Like Basel, it is designed to require banks operating a higher risk model to pay more for insurance than those running a traditional, lower risk business. These rules don't kick in until the Deposit Insurance Fund reserve ratio reaches 1.15% (not expected to occur until 2016), so there is still time to research this and prepare your bank. That way, like the matador, the rodeo clown and the cowboy, you can avoid the horns of the bull. Given the impact of this change on community banks, we will report on this subject at a future date. Treasury yields rose around 2bps as the markets steadied after yesterday's volatility. Private sector employment will be reported, but the market will be waiting for Thursday's June employment report. Deloitte estimates insiders at companies perpetrate 20% to 30% of major security breaches. However, a study by Carnegie Mellon University finds that percentage soars to 74% in the financial services industry. Chase reports May 2015 was the first month the bank saw more deposits at ATMs than it did with tellers. Meridian Compensation Partners research of executive compensation finds the number of financial metrics most companies use to determine annual incentive payouts is 1 metric (36%); 2 metrics (42%); 3 metrics (18%); more than 3 metrics (4%). Research by Accenture finds 81% of consumers now say they would not switch banks if their local branch closed vs. only 48% who said that 2Ys ago. Mobile and online plus a changing demographic is quickly shifting channels for banks. A study by Raytheon/Websense finds: banks and other financial services organizations are attacked 300% more frequently by cybercriminals than other industries. The end of support for Windows Server 2003, used by millions of businesses, happens on July 14 of this year. Bankers should make sure not only are their own servers changed over soon, but also take a close look at how customers are accessing the bank and warn them of this need to upgrade. After adjusting for recent M&A activity, SNL Financial indicates the following are the top 10 largest banks and thrifts by total assets: JPMorgan Chase (1); Bank of America; Citigroup; Wells Fargo; US Bancorp; Bank of New York Mellon; PNC Financial Services Group; Capital One Financial; HSBC North America Holdings and State Street (10). Some financial institutions that did not meet certain requirements (such as Goldman, Morgan Stanley, General Electric Capital and others) were excluded from the analysis.